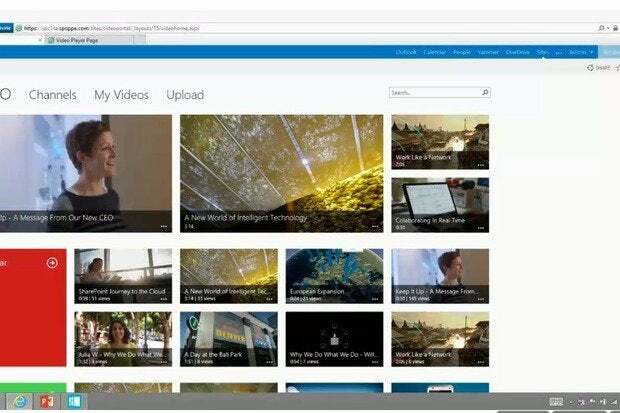 The Redmond, Wash. firm had first teased Office 365 Video in May at TechEd. "Office 365 Video provides organizations with a secure, company-wide destination for posting, sharing and discovering video content," said Mark Kashman, a senior product manager with the Office 365 team, in a Tuesday blog. Kashman touted Video as a tool for internal communications, citing the examples of new-employee orientation, management messaging and worker training. Employees will also be able to contribute to a "Community" section, though most companies will probably frown on cat antic clips. The service rolls out over the next few days to companies that have registered for Office 365's First Release early distribution program, then through early 2015 to others. Video will be available only to subscribers of Office 365's plans for enterprises -- E1 through E4 -- and universities (A2 through A4). It will not be offered to consumer subscribers or firms with small business-oriented plans like Business Essentials, Business and Business Premium. Kashman also said Office 365 plans for government agencies will get Video at some point, but he did not proffer a timeline. The other requirement is SharePoint Online, an off-premises component of the enterprise and academic plans, but missing from the increasingly popular Office 365 ProPlus, the rent-not-buy plan used by organizations that have decided to retain their back-end services, like SharePoint and Exchange, on premises. Although Office 365 Video has elements of consumer streaming services like Google's YouTube, it's strictly an in-house affair: It will be available only to employees, and then only those whom IT administrators have assigned access rights. Video will be cloud-based -- after a video is uploaded to the service and then stored on SharePoint Online, Microsoft transcodes it for streaming and pushes it on demand from its Azure Media Services. Employees will be able to watch the video on personal computers, tablets and smartphones, Microsoft said. There's a major snag on mobile, however, as Office 365 requires Adobe Flash. "Office 365 Video uses Adobe Flash Player for adaptive streaming and secure video delivery. To watch a video, you have to have Adobe Flash Player installed," Microsoft stated. That means Apple's iPhone and iPad can't stream content from Office 365 Video. Kashman hinted that Office 365 Online may be viewable on Flash-less devices in the future. "We'll share more news in the next few months about how you can best interact with your video portal from your mobile device," he said. Microsoft has other plans to expand Office 365 Video functionality, including the ability to publish Office Mix-made content from within PowerPoint 2013 on Windows. Office Mix has been most loudly trumpeted as a way for teachers to create content, but it can also be used by workers to craft and publish modified presentations originally generated within PowerPoint. Microsoft plugged the Office Mix-Office 365 Video connection, but did not specify a timetable for its availability, saying only it was "coming very soon." With some irony, Microsoft posted its demonstration videos for the new service on rival YouTube.